This traditional Palekh box has been skillfully painted by Yevgenia Shatokhina (or "Zhenya" for short, as she signs the piece). 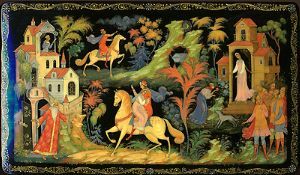 Here she has chosen to depict several scenes from the popular story of, “The Sleeping Princess and Seven Bogatyrs” written by A.S. Pushkin. The composition is painted in bright tones against the black background, and richly detailed with gold and aluminum paint. The artist has individualized the faces of all characters; each face has its own traits and shows different emotions. The box is constructed out of paper-mache. Black lacquer covers the exterior and red lacquer covers the interior of the box. The box's exterior is decorated with intricate gold and silver patterns. The lid is hinged from the top of the scene, and the box rests on four rounded legs. The work is signed with Palekh, the title, the year of 2006 and the artist's name.